Aftermath of the 6.9M earthquake on Lombok, Indonesia. Photo by Reuters. The earthquakes on Lombok, Indonesia, and the extreme weather in Britain and across Europe, have been a timely reminder of why Serve On volunteers are constantly training to respond to disasters abroad and emergencies at home. The International Response Team was on stand-by to help out European colleagues when the devastating wildfire hit Greece and, more recently, they were ready to assist if required when the earthquakes struck in Indonesia. 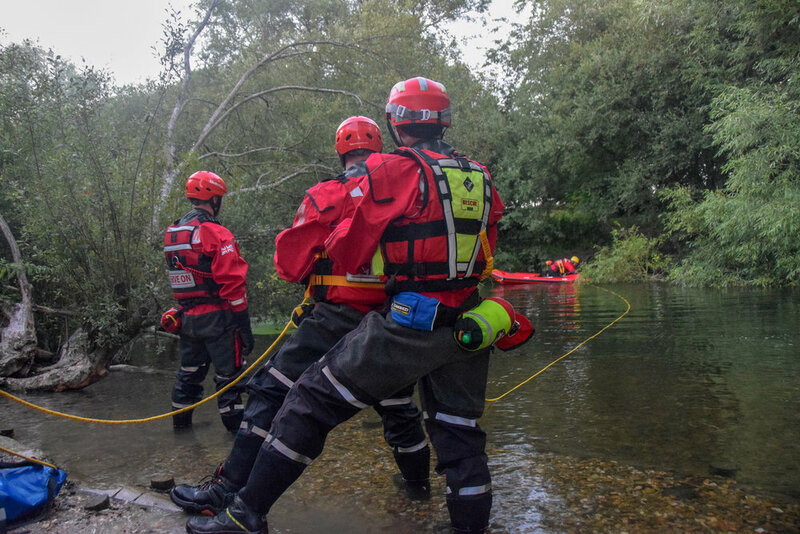 Their specialist search and rescue abilities were not needed this time, but training has carried on regardless, and it has been the same for the Community Resilience Team this past week. In Salisbury, CRT members and the Rescue Rookies were hard at work doing water rescue training, practising their rope work and their line-throwing skills for when the weather changes, as it surely will. Serve On International Response Team recruits Steve and Benjamin before their SWAH training with Ian and Nick (up the tower) at Tisbury Fire Station. Days later the action moved to Chilmark where the International Response Team recruits were starting their Safe Working At Heights training at nearby Tisbury Fire Station and practising their work with technical search equipment at Serve On’s training centre. They searched rubble piles with the CO2 detector, Seesnake, endoscope and thermal imaging camera and spent hours refining their skills with the vibraphone, knowing that intimate knowledge of these important tools could mean the difference between finding a casualty in a collapsed building or not. Big thanks to the CRT trainers and the IRT training team, including Ian, Nick, Garry, Rab, Tony, Tom, Sarah and Martin, and to Craig and Ethan for their sterling work getting the training centre into shape. The dog team were not to be left out and the K9s and their handlers got in some useful training at Chilmark, with Molly in particular making short work of finding a ‘casualty’ in our training tunnel system.